avada wrote: I don't have that icon. Maybe it was added in a later FF version. What version are you using? It's in Waterfox/56.0.3 that your UA shows you to be using. I've assigned Alt+Z shortcut to the Main Menu item: View -> Zoom -> Zoom Text Only. The shortcut was shown next to the menu item, but didn't work! Then, I assigned a shortcut for another menu item: View -> Enter Reader View. I assigned Ctrl+3 for it, checked and it worked! Then I reassigned Ctrl+3 for Zoom Text Only. Again, no luck! That menu item doesn't work irrelevant to a key combination assigned to! Then I suspected the problem takes place only when we need to reach to a menu item which is hidden under submenu in Main Menu. For testing, I assigned Ctrl+3 to View -> Toolbars -> Customize... and I was right! It didn't work either! It's about half of year gone since I had written this message, but the problem still exists! Zoom doesn't work! That's not the Browser Toolbox. That't the Inspector (CTRL+SHIFT+C). Entirely different. The Inspector is for content. Browser Toolbox is for the browser window. smsmith wrote: That's not the Browser Toolbox. That't the Inspector (CTRL+SHIFT+C). Entirely different. The Inspector is for content. Browser Toolbox is for the browser window. I see. Okay. So one of the options wasn't enabled it seems. Yes, in order to have the Browser Toolbox available to open, one must first toggle on the Advanced Setting called 'Enable remote debugging' under the options panel opened by the Gear icon at the top right of the Browser Inspector. Hello. I've been using Menu Editor since its inception but have just now tried Menu Wizard and like what I see so far. One thing that is not working for me is the "Close tab" option. In Menu Editor it worked but not in Menu Wizard. Any help appreciated. What do you mean by ""Close tab" option'? What's not working exactly? I have the "Close tab" menu item appear when I right-click inside a webpage, via Menu Wizard, as I had before using Menu Editor add-on. When I click on it though nothing happens. In the console it does show "TypeError: aTab is null" every time I do that. Don't know what happened. I hadn't updated in a month of two so I backed up my profile and then updated and still getting the same result. Last edited by makondo on March 11th, 2018, 4:17 pm, edited 1 time in total. Splat-NJ wrote: I have the "Close tab" menu item appear when I right-click inside a webpage, via Menu Wizard, as I had before using Menu Editor add-on. When I click on it though nothing happens. In the console it does show "TypeError: aTab is null" every time I do that. Don't know what happened. I hadn't updated in a month of two so I backed up my profile and then updated and still getting the same result. is there a chance to add an option to the right click menu which lets me delete messages from the mail server? I know there is an option in thunderbird itself to do so, but It's either on or off. I don't want all of my mail that goes to the trash to be deleted from the server. The best thing for me would be an option to choose via the right click context menu between "delete" and "delete from server", both resulting in moving the selected mail to the local trash but only by choosing the second one in also deleting from the mail server. Any help is highly appreciated! Thanks in advance. Still searching for a solution. Could anyone please advise? Providing the command line for the action "delete mail from server" would help a lot already! Pag77, that did it! Thank you! Content deleted, 'cause it was a stupid question & I can't find a delete post button. The remedy to many illusory bugs is: Drink more coffee & reboot brain. 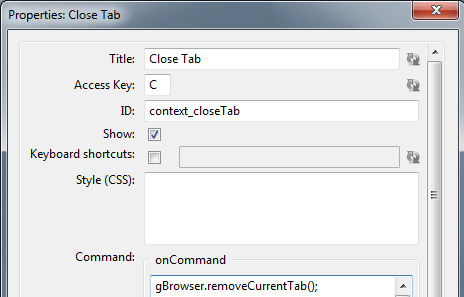 I can't get hotkey for "Close Tabs to the Right" and "Close Other Tabs" to work. Any clues?